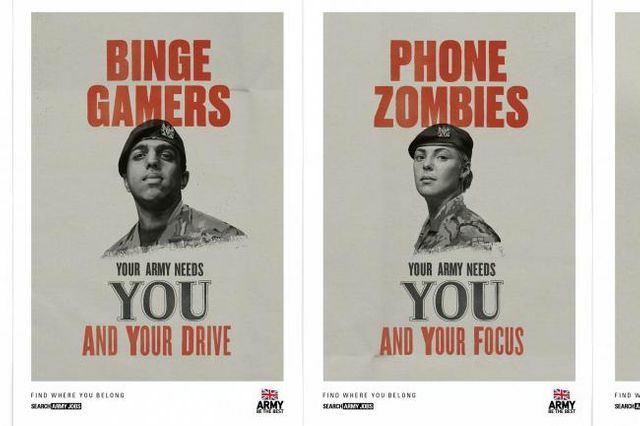 The Army's new campaign for phone zombies and binge gamers - posters? It's always fascinating to see the latest campaign from the Army, usually creating much debate. Whilst struggling to reach its recruitment numbers and the lowest unemployment rate in 40 years, any campaign is going to have to work harder than ever. In trying to battle for the attention of the much discussed millenials, it will be interesting to see whether a campaign involving posters and TV with a twist on an old campaign will produce the cut through required. A new Army recruitment campaign seeks to target gamers and millennials stuck in 'boring jobs'. In the new series of adverts the Army hopes to show how current 16 to 25-year-olds may already have many of the attributes needed in the modern military, but either dismiss them as irrelevant or see them as embarrassing. The new recruitment advertising campaign, titled ‘Your Army Needs You’, launches on January 3 with a series of adverts on TV and the internet as well as billboard posters. The three adverts tell the stories of individuals whose perceived weaknesses are seen as strengths by the Army. Potential recruits are shown at home or work, with others calling out their stereotypes, before the scene changes to depict them in the Army performing roles where their potential is recognised. Does your image match the reality? 52% are looking, are your social channels ready?